Jan 2015: Well, this one has been on my list to visit for some time and I finally had an opportunity to explore this airport recently and it did not fail to impress. 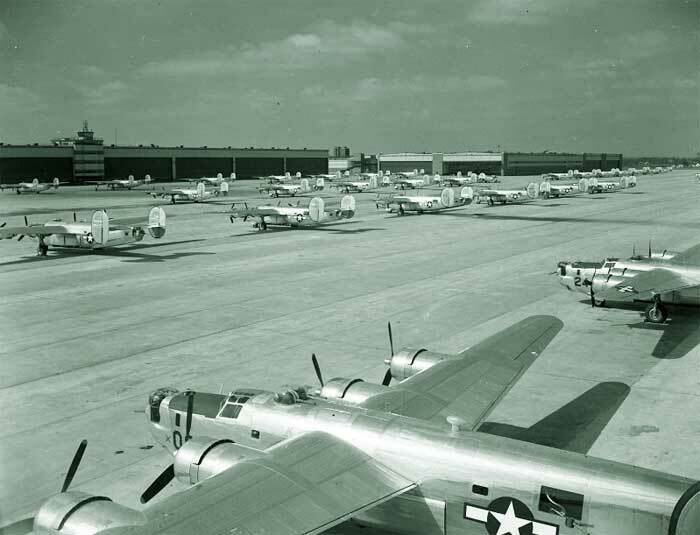 Willow Run airport is arguably one of the most historically significant airfields in America, having been built starting in March of 1941 and completed just six weeks after the attack on Pearl Harbour in December of the same year. 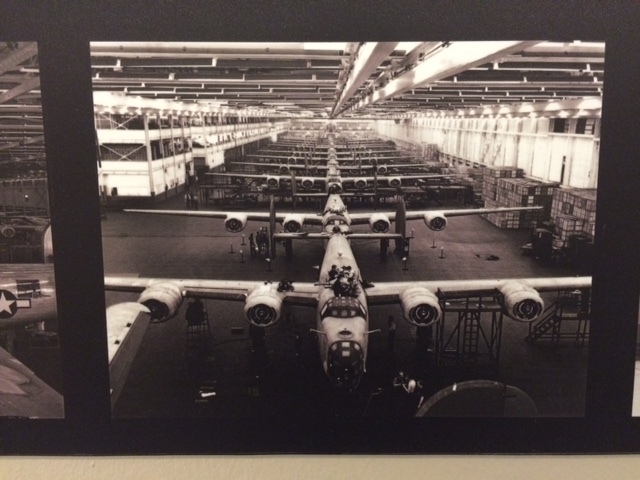 It was a massive facility covering over 3.5 million square feet (later expanded to 5 million square feet). 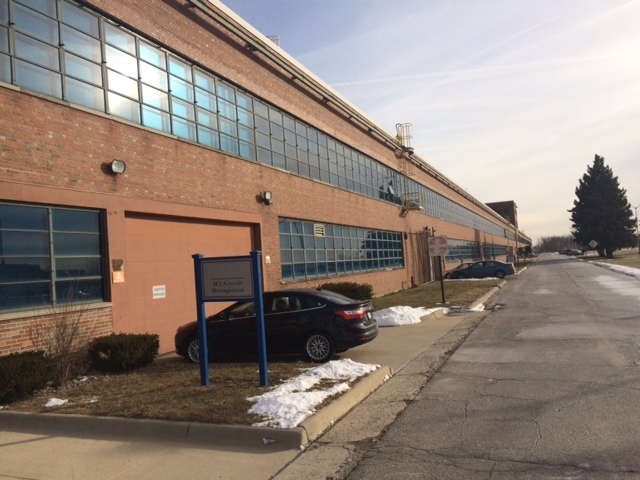 Most of the original assembly building has been since torn down but a small section of the final assembly building (still pretty big at over 100,000 square feet) has been preserved and many of the administrative offices (pictured below and above) and repair hangars still exist, relatively unchanged since the war. I thought I'd drop by on a recent trip home from Toledo and see what I could find of interest. 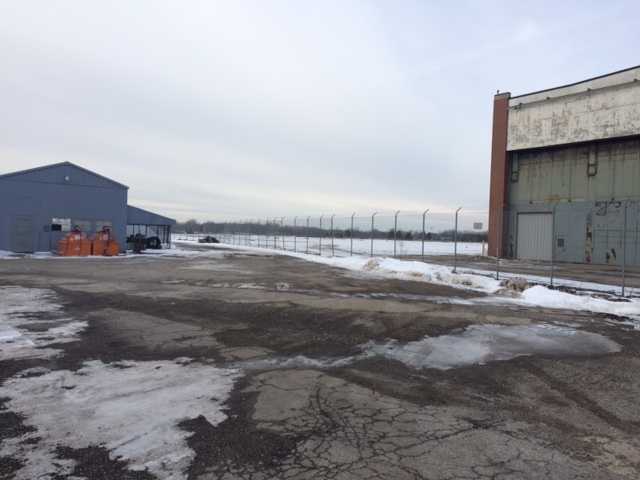 Forty-two thousand workers were once employed at this site (building B-24 Liberators), so I had no problem finding a parking space upon arrival. 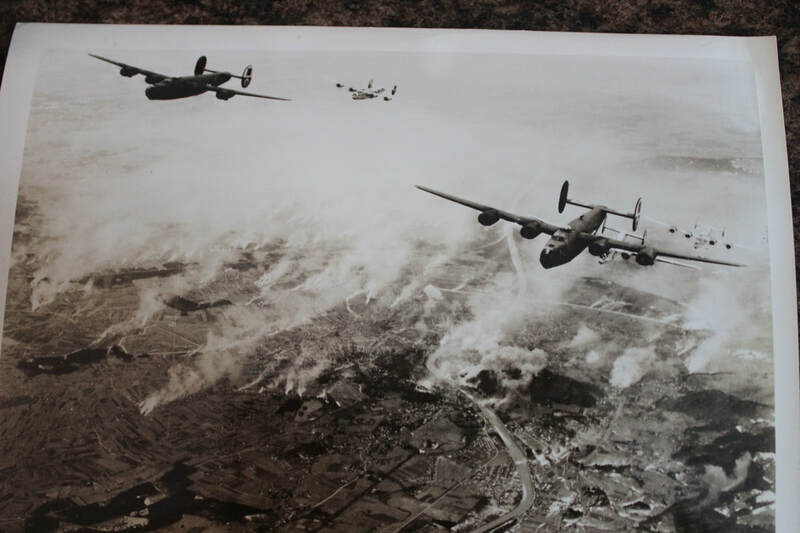 Old US Army AirForce image #55437 of Twining's 15th airforce over the railyards at Salzburg Austria in B-24s. 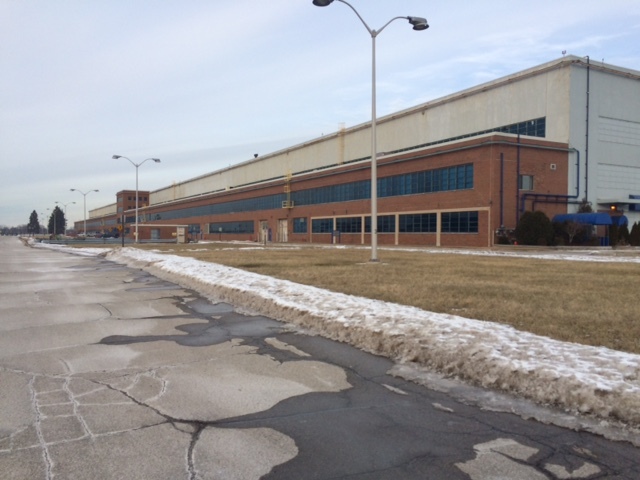 this building contained offices and the repair hangars for the original B-24 plant and is now occupied by several private aviation companies and Border Security offices. The size of the building is actually small compared to the original factory that has since been torn down and would have been behind the photographers back in this shot. The top floor is eerily vacant with the border Security offices below. No one seemed to mind me exploring the building unattended. This shot looks toward what is left of the final assembly building (with the two big hangar doors) and the open door is where the train would drive into with supplies. The building is less than 5% of the original structure which laid behind and to the left of what you can see in this photo. photo: Ford Motors. Photo on left shows as it is today. Final assembly building-it's bigger than it looks. The two doors on the left side of the photo below would have been the same as the two doors on the outside of what remains of the assembly building in my photo above. The building that remains is a paltry 150,000 square feet or so to put things in perspective. 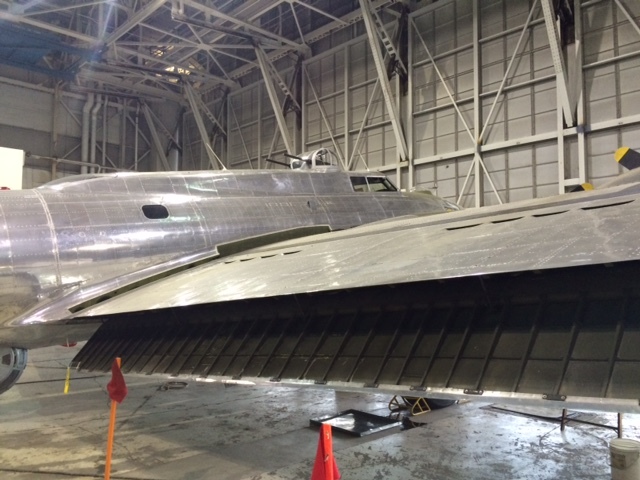 This building sits perpendicular to the final assembly hangar forming a bit of an "L" shape surrounding the mammoth apron where completed B-24's would have been parked. 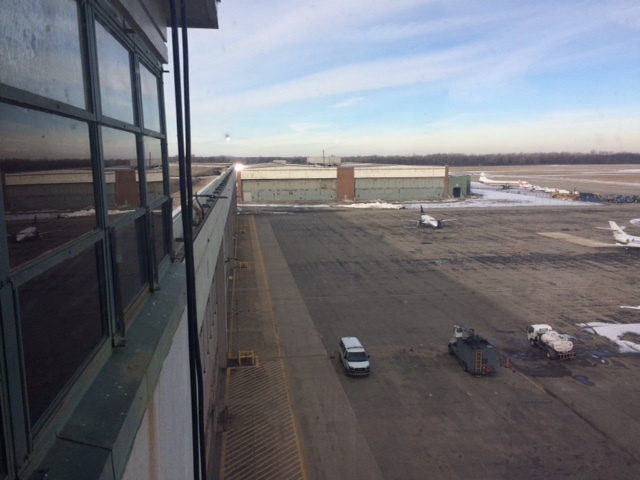 The hangars in the building shown were the post-testflight repair hangers for anything that needed tweeking after testing. In the vintage photos above you can see how the bombers made a sharp 90 degree turn before exiting the assembly building- this was a result of the fact that the building was so large that if they exited straight out, they would have been in a different county's jurisdiction and subject to an additional tax- so they turned them out the side of the building to avoid the extra tax burden. The open area all the way to the treeline between the two buildings was once B-24 factory. 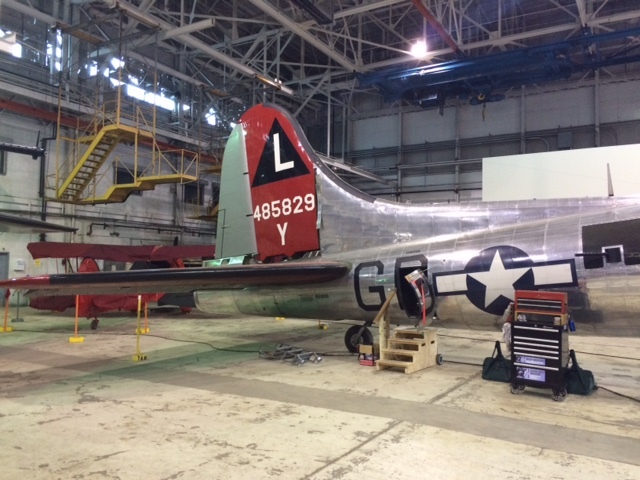 I figured as long as no one was complaining about me walking about the apron, I'd try my luck accessing the hanger and was pleasantly surprised to stumble across a couple of very friendly mechanics who were busy prepping the museum's B-17 and B-25 bombers for the 2015 airshow season. 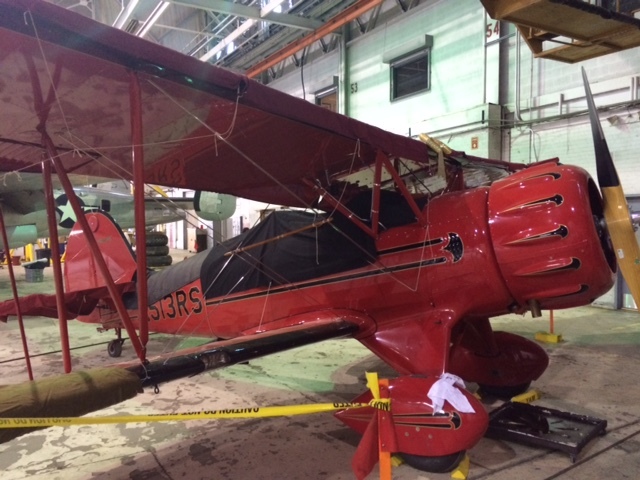 The nice thing about Americans and airplanes is that they enjoy sharing their passion for flight- places that would be restricted in any other country will often elicit an invitation to explore if you show even the slightest interest in aviation. 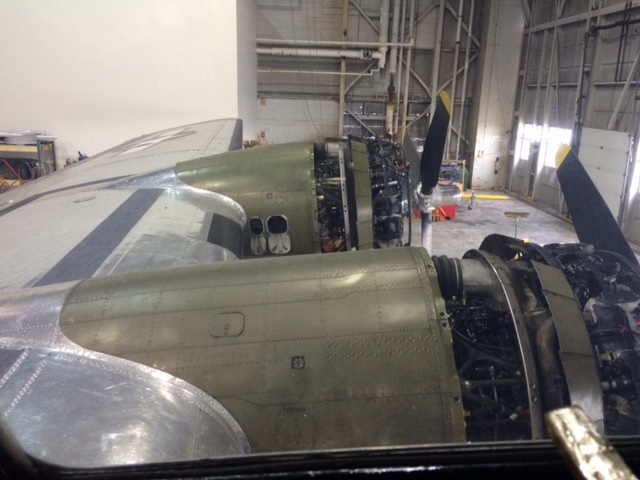 If you're an obvious enthusiast, they may just let you climb through their B-17! 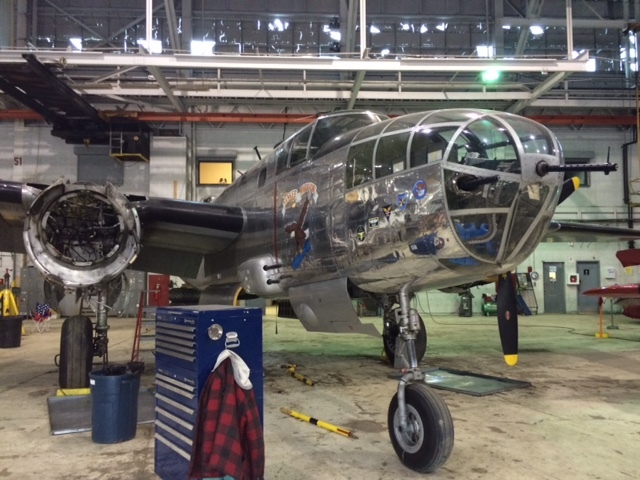 This B-25 below was being repaired after an engine fire recently (the left engine had also experienced the same not long ago). These sorts of things are bound to happen occasionally when you maintain aircraft this old in flightworthy condition, and I'm still torn on the prudence of flying aggressive flight schedules on 70 year old aircraft- eventually, they're going to wear out or worse crash when even the most skilled pilots will no longer be able to fly enough hours to remain proficient in them. Not to mention the availability of replacement parts. But they do look and sound great when flown! 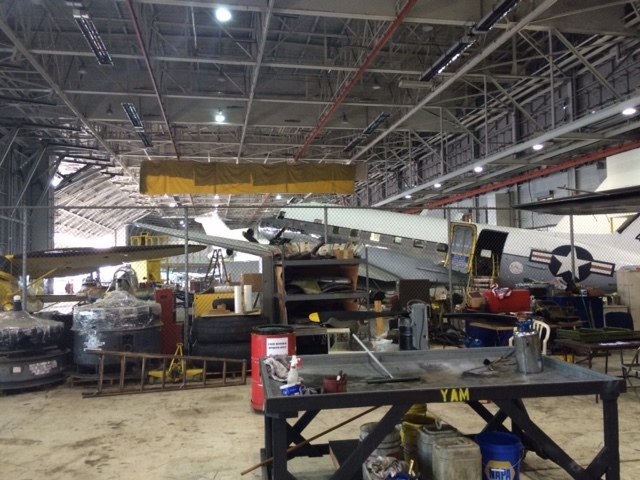 Massive hanger doors inside the B-24 repair shops. 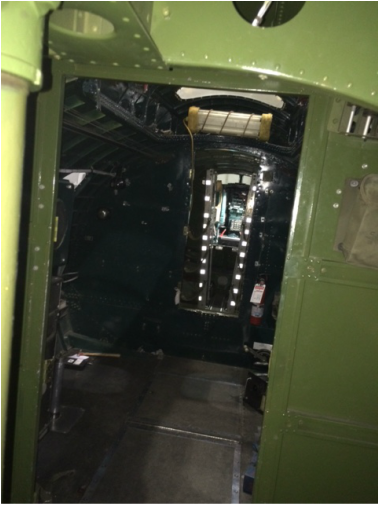 Inside the B-17 looking to the back. Notice the tight quarters between the two machine guns and the ball turret in the middle. Looking forward to the Bombay and cockpit. 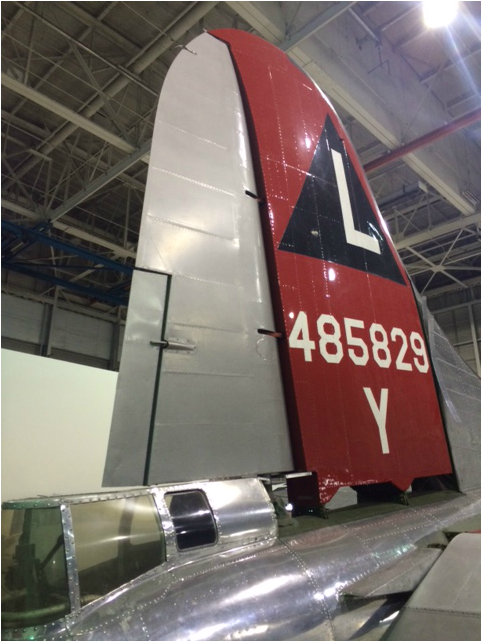 Business end of the tail. 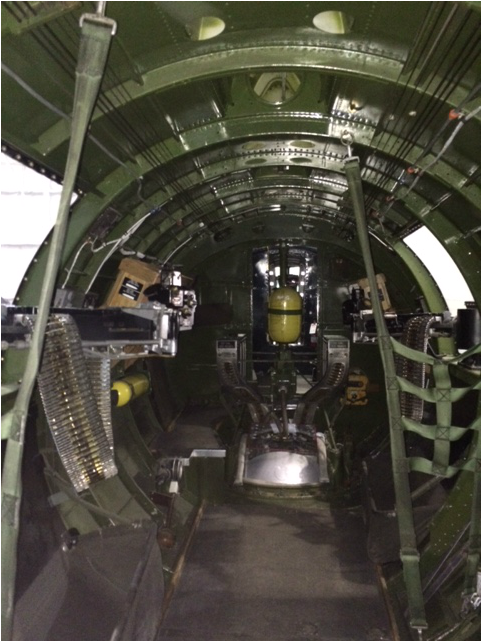 Narrow catwalk in the B-17 bomb bay. 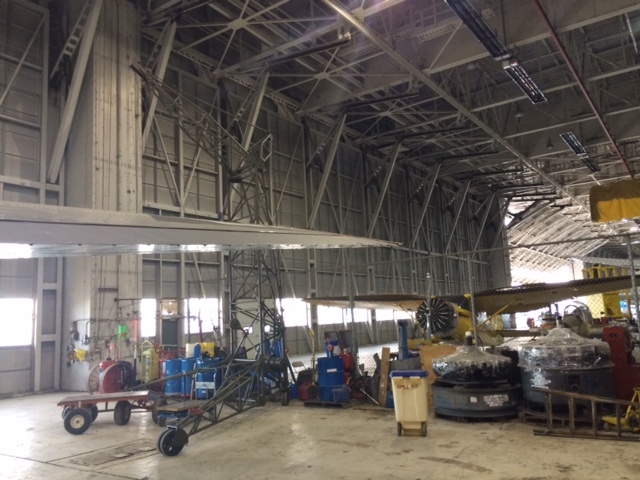 President Barack Obama recently toured the hangar at Willow Run and of course, the presidential security contingent first had to check the complete facility before his arrival including climbing through the B-17 ; they were concerned about the bomber's machine guns until they were shown that all of the original guns had been replaced with non-functioning replicas. 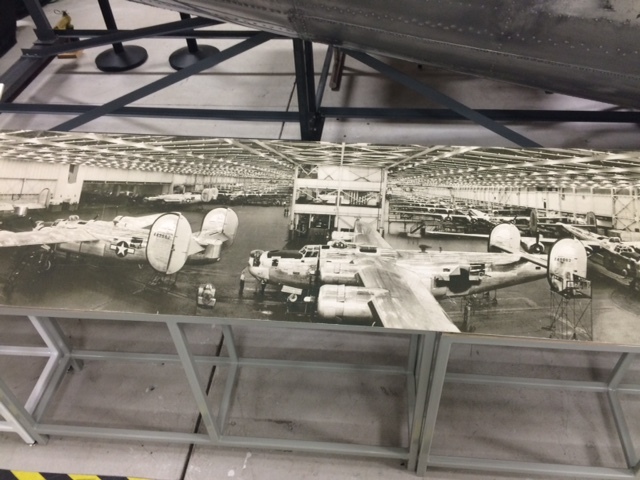 This photo taken from the forward nacelle where the bomber would set his sights on the bombing target. 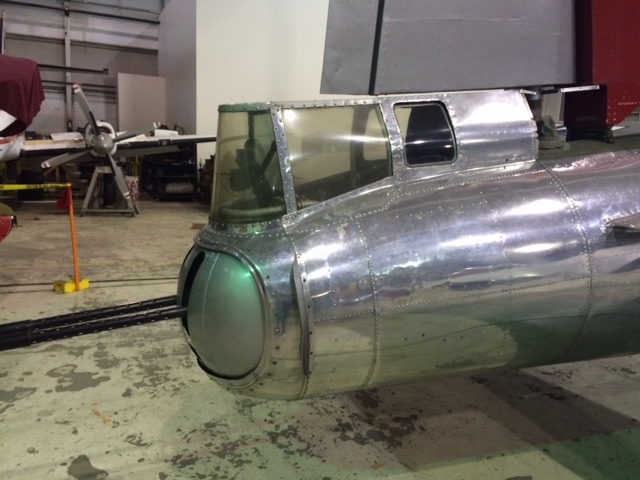 The Norden bombsight was a significant technological achievement and was a closely guarded secret by the Allies. 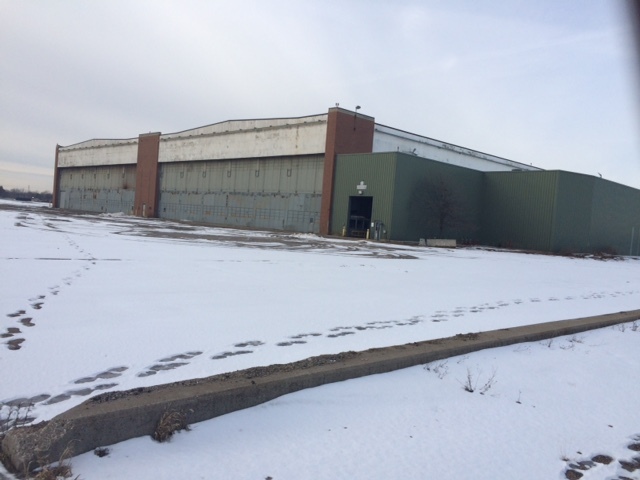 Outside the huge maintenance hangars and offices, which although built by Henry Ford, was later used by GM in the years after the war as the Willow Run Transmission plant until 1992.